Podcasts have never been more popular, and for good reason: they’re highly engaging, and a great way to draw attention to your business, sell your products, and earn money through advertising – but they also take a good deal of work to create. You need microphones, audio editing, and podcast hosting. It’s easy to focus on the first two on this list, but quality podcast hosting is going to let you take your podcast to the next level. At a glance, the choice may appear obvious: choose an all-in-one podcast hosting service, and leave it at that. This, however, gives up control and choice on how your podcast is distributed, where it is stored, and how visitors can access archives. The answer, then, for podcasts wanting full control, flexibility, and ownership, is to self-host your podcast, and choose WordPress podcast hosting. Alongside having full control, you’ll also be able to create better archives for your podcast (making it easier for new listeners to get onboard), access analytics you’d otherwise miss out on, and even keep listeners hooked by subscribing them to your newsletter. If you’re thinking to yourself no way, self-hosted sounds like far too much hassle, you might be surprised to find out it actually takes very little effort to set up WordPress podcast hosting, and virtually no effort to maintain. This post will be your complete guide to podcast hosting with WordPress. 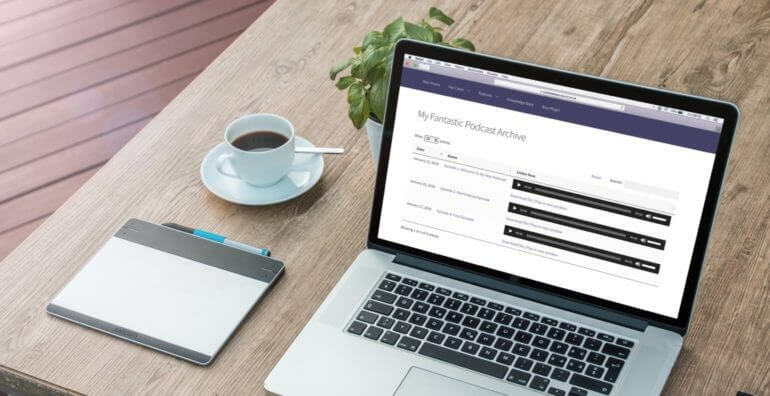 We’ll show you how to set up a filterable, sortable podcast (with easily navigable archives, analytics, and email signup forms) on a self-hosted WordPress website. We’ll even show you how to keep listeners hooked by automatically sending them new episodes by email. Getting a WordPress website online. 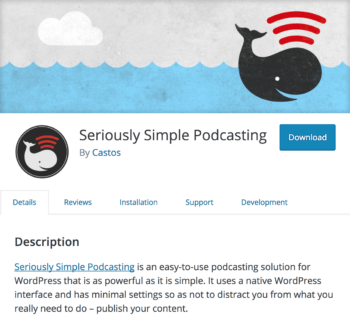 Adding podcast episodes to your site using the Seriously Simple Podcasting plugin. Creating a sortable podcast archive using the Posts Table Pro plugin. Submitting your podcast to iTunes, measuring itys success with analytics, and turning listeners into subscribers with an email newsletter signup + auto sending of new episodes. We’ll keep costs to a minimum here: you’ll need to pay for WordPress hosting (and a domain name, if you need one) and the Posts Table Pro plugin for podcast archives, but that’ll be it. You can get a head start by getting Posts Table Pro right away. Create your WordPress podcast site today! Back when it was hard to get high-quality hosting at reasonable prices, hosting companies would get a bit huffy about the large amounts of data transferred by podcasters’ audio files. Because of this, it might have made more sense subscribing to an all-in-one podcast hosting service. Compared to a website with just text and a few images, podcasts do use more data. Thankfully, we now we have ready access to super fast, reliable hosting, so the data transfer issue is becoming increasingly irrelevant. For most, going the self-hosted route is now by far the most beneficial. By choosing the open source software, WordPress, rather than a traditional podcast hosting service, you’ll maintain complete ownership over your podcast content. You’ll also be able to maintain a core focus for your podcast marketing, with a central point to direct social media and search engine traffic to, a place to analyse listener numbers and engagement, and the option to hook listeners or advertise in whichever way fits your business model. Overall, it’s just much more flexible. If you already have a WordPress website up and running, skip ahead one section, to add your podcast episodes to WordPress. Firstly, you’ll need a domain name so people can find your website and podcast easily. If you have a domain name already, you’ll simply need to direct it to your WordPress hosting. If not, you can pick one up for a few dollars through a domain name provider, such as NameCheap. You should pick a domain name which matches either your brand, or your podcast name (Domain Wheel is great for generating ideas). We’ve previously discussed in detail how to choose a host for your WordPress website. For the purposes of hosting your podcast, we recommend getting started with some robust managed hosting, such as that offered by WP Engine. WP Engine specialize in WordPress hosting, offer exceptional support, and have useful tools you can access directly from your WordPress dashboard. The other benefit of using a WordPress hosting specialist like WP Engine, is that all the work of installing WordPress is done for you. That means you’ll be able to get on with the important business of designing your website and getting your podcast online. There are thousands of free and premium themes available in the WordPress theme directory – you can search and install these from your WordPress Dashboard by going to Appearance → Themes → Add New. One of the recent (free) themes which are included in all WordPress installations (the Twenty Something series) would be a convenient starting point. You can always change your theme later. If you aren’t familiar with WordPress, check out our top tips on creating a low maintenance WordPress website. If you choose your theme wisely, you won’t even need to do any code – perfect for non-techies! CodeinWP have a good list of free WordPress themes. Now you have your WordPress website ready, the next step is to upload and organize your podcast files. There are a couple of ways you can go about uploading your podcast. The less desirable option is to add your media files directly to a post or page on your WordPress site. This will work fine in that people will be able to access your podcast on your website. However, it makes it tricky to measure your podcast’s success, and even trickier to get the formatting correct for submitting to iTunes. To solve these issues you can create a specific custom post type to make sure all the information is in the right place. Instead of reinventing the wheel, we recommend taking the quicker, easier (and free) alternative, which is to use a plugin that does exactly what you need it to. First up, you’ll need to add this plugin to your WordPress site. Go to Plugins → Add New and search ‘Seriously Simple Podcasting’. Click Install Now then click Activate. If you’re going to group your podcast episodes by series, you’ll need to create a series category. To do this, go to Podcast → Series. Fill out the fields to give your first series a name (e.g. Series one) and, optionally, a description. Click Add New Series. Go ahead and create another series (or multiple other series) if you have more podcast series ready to upload. Next up, you’ll want to start adding your podcast episodes to the site. If you like, you can include a full description or transcript of your podcast episode in the content box just under the title in the editor. And, if relevant, you can select which series the podcast belongs to on the righthand side of the editor. You can also add any relevant tags to each episode. We’ll show you listeners can filter your podcast episodes by these taxonomies later on. If you then scroll down, you’ll find the Podcast Episode Details box. Here is where you’ll upload your first podcast episode. Select whether you’re uploading an Audio or Video file, click Upload File, upload your first podcast file, then click Select. You can manually add the duration and file size, or leave these fields blank to auto calculate. Add in the date recorded so listeners will know how old or new your podcast is. 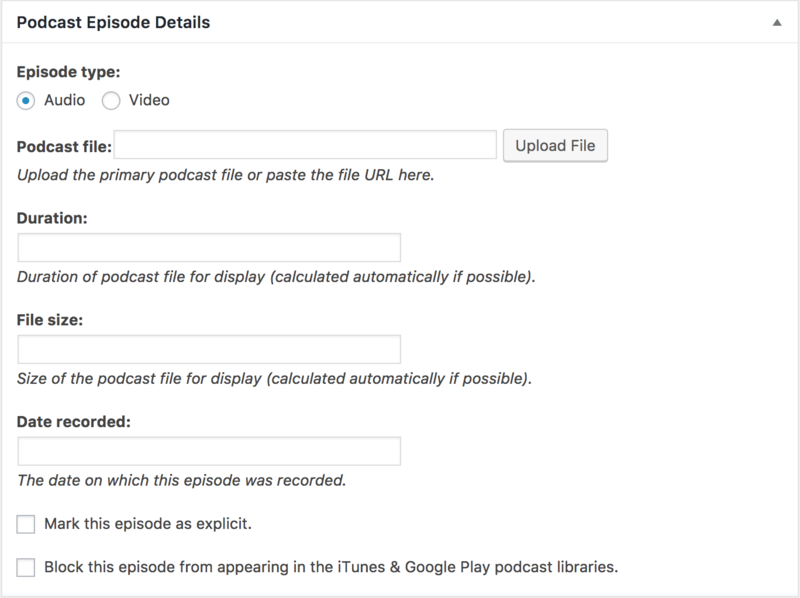 If necessary, there’s also the option to mark specific episodes as explicit, or choose to block them from appearing in any external podcast libraries you submit your podcast to. It’s a good idea to add a summary of the episode in the Excerpt box as we can display this later in our searchable podcast library. Add your podcast’s series, and any relevant tags. Users will be able to use these to quickly filter the episodes they want. Hit Publish and your first podcast is ready to go! Add in any remaining podcast episodes, by going to Podcast → Add New again and repeating the steps above. Once you’ve added all your episodes, it’s time to display them nicely on your website. Next we’ll cover how to enhance your self-hosted WordPress podcast hosting, by creating a sortable podcast archive which can display your latest episodes in a convenient format. Your website needs to be an easy place for visitors to listen to your podcast. Visitors should be able to find episodes they’re interested in, easily listen to them, and sort through your archives. This section will show you how to do precisely this. Seriously Simple Podcasting lets you display your most recent podcasts, but just displaying a long list of podcasts in the order of newest to oldest isn’t always the most helpful – especially if you’re trying to engage new listeners, or those who have missed a few episodes. A better solution is to create a library of your podcasts by displaying them in a sortable and searchable table. This will let your listeners quickly sort through episodes, conveniently listen to them, and makes everything extremely simple for you. The Posts Table Pro plugin can pull in all the information you’ve already added using Super Simple Podcasting. It uses this information to autogenerate your podcast library, in a sortable, filterable, and searchable list. This is the perfect format for podcast archives. The animated screenshot above shows this in action. Note how listeners can even conveniently filter by podcast series! In addition to the benefits mentioned already – listeners can search all your podcast episodes in one place, easily find the episode(s) they’re looking for by sorting the table or filtering by series or tags, and listen to episodes directly from your podcast library – you can even add newsletter signups to this page in order to keep listeners hooked, which we’ll cover after this section. To get started, purchase and download the plugin. Your purchase will include instructions on installation and setup. Once installed, decide whereabouts on your website you’d like to display your podcast library. This might be on your home page, or on a separate podcasts page. In this example, we’ll be putting our podcast on a homepage. Try copying and pasting this code onto the content Visual Editor on the page where you want to display your podcast library, then click Preview. This will autogenerate your podcast library. posts_table tells your website you want to display a table here. post_type tells it which post type you want to display. Here we’re displaying the custom post type podcast. columns="" tells it which columns you want to display within the quotation marks.Use commas to separate each column you want to include. You can easily rename a particular column with a custom heading, for example, we’ve renamed the title column with the custom header Name using the shortcode title:Name. title displays the episode title (i.e. the one we’ve renamed Name). date will display the date your podcast episode was published. excerpt displays a short excerpt/description if you included one. This is also where we’ll display a media player for each podcast. We’ve renamed this column Listen Now. 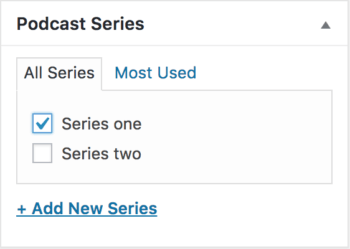 filters="series" will set your table to be filterable by the podcast series, as shown in the example above. You can amend this to filters="series,tags" in order to let listeners filter your episodes by series and tags applied to each episode. 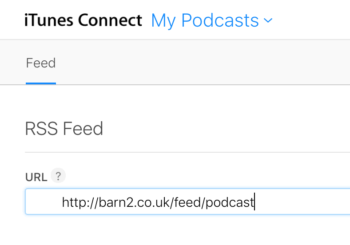 If you don’t want to link through to a separate page for each of your podcast episodes, you can also add the code links="none". This is especially useful if you haven’t written long descriptions or transcripts for each episode. There are lots and lots of customization options available with Posts Table Pro. Check out the documentation for more details an a full list of shortcode options. We also have full documentation on using the filters. When you’re done making your library look great, click Publish and the page will publicly display the table with your podcasts. Nice work! Visitors can now easily find your entire archive of podcasts, and you’ve made a fantastic self-hosted podcast solution. You can use a similar technique to create a WordPress audio library. The linked post will even show you how to use WooCommerce Product Table to sell access to your podcast. Now your podcast hosting is all set up and your podcasts are beautifully displayed on your website, you’re ready to get promoting and growing your podcast further. This section will show you three advanced next steps you can take, two of which you can only do because you’ve chosen to self-host your podcast hosting. We’ll show you how to submit your podcast to iTunes, how to set up podcast analytics, and how to add an email signup box in order convert listeners into long-time subscribers. To increase your audience reach, you need to submit your podcast to iTunes. Yet another useful feature of the Seriously Simple Podcasting plugin, is that it organises your podcast episodes in an iTunes-friendly format. Once you’ve uploaded your episodes to your WordPress website, you’re almost ready to submit them all in one go to iTunes. The iTunes podcast library gives you free access to a huge podcast distribution network: every Mac, iPhone, and iPad in the world. Before you do, you’ll just need to go to Podcast → Settings → Feed details and upload a Cover Image for your podcast. Once you’ve done that, to submit your podcast to iTunes, simply go to Apple’s podcast submission page and sign in using your Apple ID (or create one if you don’t have one already). The Seriously Simple Podcasting plugin will autogenerate a URL for your podcast. You can find this in your WordPress Dashboard by going to Podcast → Settings → Publishing. You’ll then see a preview of how your podcast will appear on iTunes. Once iTunes is happy your podcast meets the requirements, and you’re happy with how everything looks, click Submit. Podcasts can take up to 10 days to make their way through the iTunes approval process, but are often processed much faster than that. 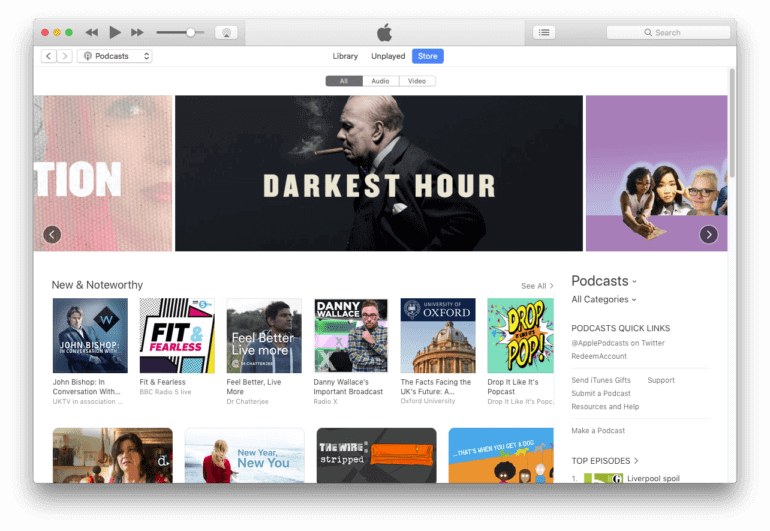 Once complete, you’ll be able to see your podcast in iTunes – alongside the best podcasts in the world. While you’re waiting for your podcast to be approved on iTunes, it’s worth getting your analytics set up too. We’ll look at these next. If you want to successfully grow your podcast audience, it’s important to keep track of how many listeners you have, and how they’re consuming your podcasts. There are a multitude of analytics tools out there, but seeing as we’ve already installed Seriously Simple Podcasting, let’s go ahead and use their add on plugin, Seriously Simple Stats. Just like the name suggests, this plugin is seriously easy to use, and ideally suited to measuring the success of your podcast. Among other things, it can measure where people are listening to your podcast (e.g. iTunes, your website, or via a download), how many listeners you have, and what your most popular episodes are. This is all vital information you can use to optimise future podcasts, source sponsorship, and boost advertising revenue. 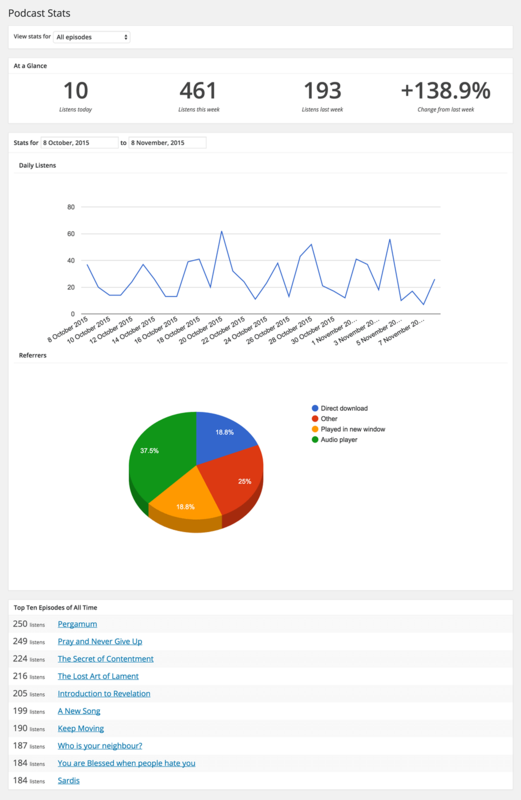 You can download Seriously Simple Stats free from the WordPress plugin directory. Go to Plugins → Add New then search “Seriously Simple Stats”. Click Install Now then click Activate. You can access Seriously Simple Stats right from your WordPress dashboard, head to Podcast → Stats. Your stats will start showing up here over the coming days. The industry secret is podcast stats are horribly unreliable: keep in mind that a download to your podcast isn’t necessarily a listen to your podcast. My podcast app, for example, downloads the latest episode of my favorite podcasts every week. I don’t necessarily listen to them, and if I do listen, I don’t necessarily listen all the way through. Don’t be disheartened by this; given podcasts are downloaded and listened to separately, there’s no prospect of fixing this in the short term. What you can do, however, is keep your listeners hooked by connecting with them in your email inbox and your podcast app. We’ll cover how to handle this next. Don’t miss out on turning one-off listeners into long-term subscribers! Getting inside your listeners’ email and their podcast app is a great way of ensuring listeners know about latest episodes, what you’re doing, and are excited about the podcast in the long term. We’ll let you collect email subscribers by adding an email subscription box to your podcast page using MailChimp and the MailChimp for WordPress plugin. This is a major benefit of handling your podcast hosting yourself. First, sign up for a free MailChimp account if you don’t already have one. The free account lets you have up to 2,000 subscribers, which is plenty to be started with. Next, add the MailChimp for WordPress plugin to your site: in your WordPress Dashboard, go to Plugins → Add New, then search “MailChimp for WordPress plugin”. Click Install Now then click Activate. You’ll need to pair this plugin with MailChimp. From the Dashboard, head to MailChimp for WP → MailChimp, and click Get your API key here. Copy your API key from MailChimp and go back to MailChimp for WP → MailChimp. Paste the key into the API Key box and click Save Changes. Once connected, you’ll also need to create a new list in MailChimp to start collecting email subscribers. From MailChimp, go to Lists → Create List → Create List, and fill out the details. Next, create the sign up form for your website. From your WordPress Dashboard, go to MailChimp for WP → Form, give your form a title, select the MailChimp list you want subscribers to be added to then click Add new form. You’ll be collecting podcast subscribers in no time! Hooray! You now, however, need to be emailing new episodes out to your subscribers. You can automate this by connecting your podcast RSS feed to Mailchimp. Our popular tutorial on how to create an RSS-Driven Campaign in MailChimp shows you how to do this, and take a step out of your podcast email setup. Choosing to manage WordPress podcast hosting yourself is remarkably easy, and this tutorial has shown you everything you need to know. We’ve shown you how to set up WordPress, add the podcast, and then make use of features you can only get if you self-host your podcast, including a sortable archives page, and effective email signups. Set up a WordPress website – with managed hosting and a simple theme. Download the Seriously Simple Podcasting plugin. Upload all your podcast episodes to your website. Download the Posts Table Pro plugin. Add the shortcode to your site to autogenerate your searchable podcast library. Power up your podcast by submitting it to iTunes right from your website, and monitoring your analytics using Seriously Simple Stats. Automatically email your podcast subscribers with new episodes. Let us know how you get on with your self-hosted podcast library. We can’t wait to see the clever things you do with it! Excellent write up on podcasts. I was fed up while searching free podcast sites, but almost all free podcast sites have some or the other limitations which would compel anyone to ultimately buy their plans. I wanted podcast submission only for gaining backlinks, hence this post of yours was truly amazing.